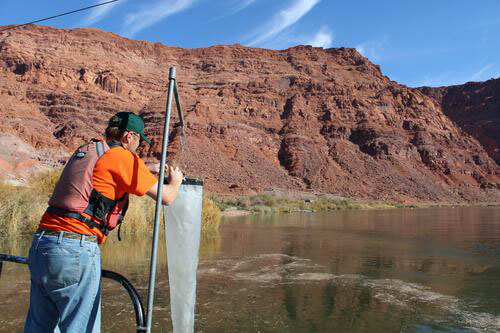 A USGS scientist sampling invertebrate and organic drift at Lee’s Ferry along the Colorado River. Photo Credit: US Geological Survey. The U.S. Geological Survey (USGS) was established in 1879 to provide a scientifically based classification system for federal public lands and the natural resource values associated with them. Its duties include the development of topographical maps and evaluation of the land’s geology, minerals, and hydrology. The USGS arose out of the need for the federal government to have more knowledge about the lands within the federal domain and how those lands could support economic development in the Western states and territories. One of the early directors of the USGS was General John Wesley Powell, who brought an interest in paleontology as well a focus on the settlement of the arid West and the relationship between settlement, water storage, and irrigation infrastructure. Powell expanded the mission of the USGS to include detailed research into the quantity, quality, distribution and movement of surface and subsurface water resources. Today, the USGS still serves many of the important functions it has performed since its inception. The agency provides critical mapping data on digital viewing platforms, enabling federal agencies as well as the public to better know and understand the immense landscape of the West. The USGS also continues its role in providing important research on hydrology to understand the critical water resources that support communities and economic activities. In the Verde River watershed, the USGS, in partnership with the Salt River Project (SRP), continues to provide water flow monitoring through stream gauges located throughout the watershed. The Watershed Monitor web site tracks streamflow as recorded at USGS and SRP gauges as well as precipitation levels, and makes that information available to the public online at the following site. This information is tracked for the Salt River and Verde River watersheds. The USGS also supports research in the Verde River basin that enables a better understanding of the watershed’s groundwater resources, aquifers, seeps and springs, and the base flows of the Verde River. This work has greatly improved stakeholder understanding of the dynamics of the watershed, including the interaction between groundwater pumping and surface water flows in the Verde River. It has also been instrumental in stakeholders having an improved understanding of water resource limits in the region. In 2011, the USGS developed the Northern Arizona Regional Groundwater Flow Model (NARGFM). The NARGFM is a computerized simulation of groundwater flows in northern Arizona, including the groundwater flows in the upper and middle reaches of the Verde River. The NARGFM modeling work has been valuable in shedding light on the impact that groundwater pumping via wells is having on the flows into and out of aquifers that support surface flows in the Verde River. It also continues to inform other research into the impacts of groundwater pumping on continued flows in the Verde River and its tributaries. For more information about the USGS and its work in the Verde River watershed, visit the USGS Arizona Water Science Center here.